Launched this year, From Roy is a new online retailer of panettone, a type of sweet bread loaf originally from Milan, with a recipe concocted by Roy Shvartzapel, owner and baker of Common Bond, a bakery in Houston that commands 45-minute wait lines for its baked goods. From Roy offers only two kinds of panettone and each is $50 worth of 10 to 12 servings with one month shelf life. (Leave me alone in a room with it and that’s 1 serving and shelf life of 10 minutes). 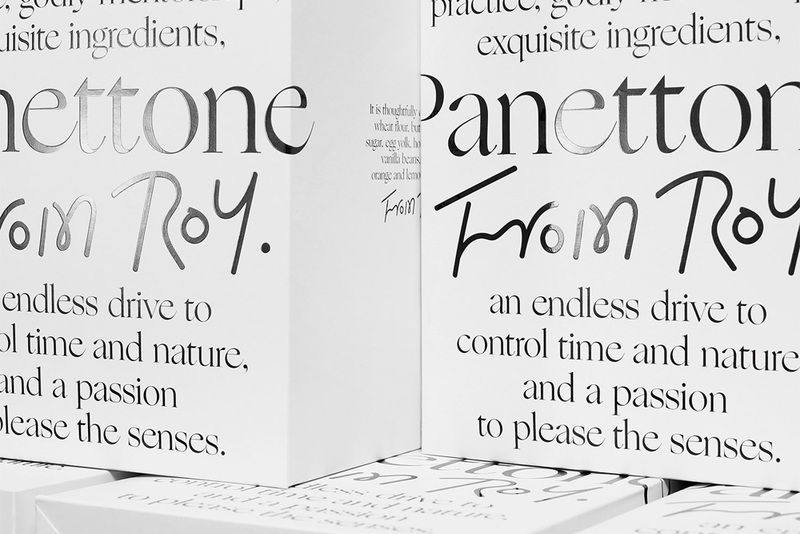 The identity and packaging for this new luxury baker has been designed by the New York office of Base Design. 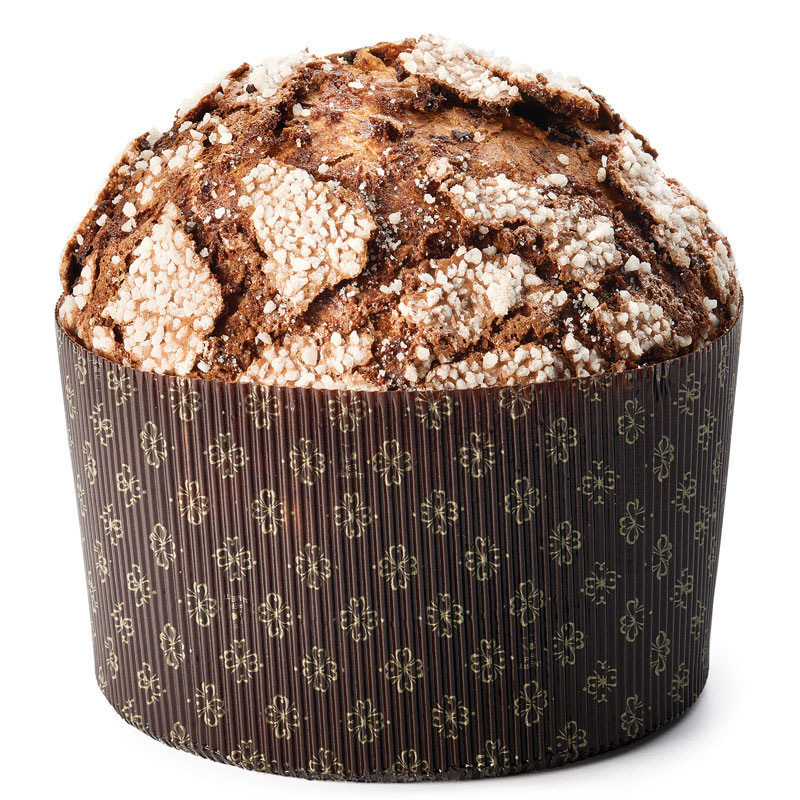 Chocolate Panettone. I’m sorry you had to see this. Nothing you eat all day will match how good this looks. This would normally classify as a Friday Like, being a relatively small business and being more on the quirky side but it’s all so well done I thought it warranted its own post. The logo goes for the signature approach and whether that’s Roy’s actual handwriting or not, it’s a kooky one. Never seen an “Fr” ligature or “m” like that but it’s those quirks that make it stand out. Not to backtrack on other posts but as a point of comparison, if you look at the recently Noted YourTango logo, which uses the same approach, From Roy manages to capture a unique mode of handwriting instead of just a basic depiction as YourTango. It’s not always easy for me to put in words why something works or doesn’t but here are two examples of apples to apples and From Roy definitely tastes better. Anyway… I really enjoy the logo and it’s used at just the right amount of rotation to make it believable that someone wrote it on an unlined piece of paper. It also pairs really well with the selected brand typeface: Ogg, designed by Lucas Sharp for Village. The black and white palette of the perfectly cubed box denotes immediate luxury and that you are not getting a Cinnabon in the mail. The centered typography is as basic as it gets but it works flawlessly in this case. I love how the typography is not small and dainty but large and confident, with the “Panettone” text bleeding off the edges. Overall, the logo and packaging make it feel like this piece of bread is worth $50, and that’s not an easy task. 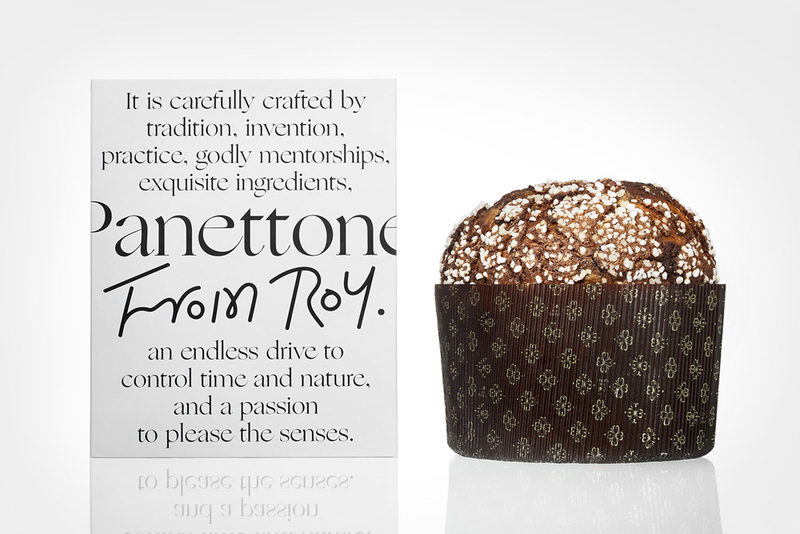 Launched this year, From Roy is a new online retailer of panettone, a type of sweet bread loaf originally from Milan, with a recipe concocted by Roy Shvartzapel, owner and baker of Common Bond, a bakery in Houston that commands 45-minute wait lines for its baked goods. From Roy offers only two kinds of panettone and each is \$50 worth of 10 to 12 servings with one month shelf life. (Leave me alone in a room with it and that's 1 serving and shelf life of 10 minutes). The identity and packaging for this new luxury baker has been designed by the New York office of Base Design.